You can still shop the sale and get a FREE style. 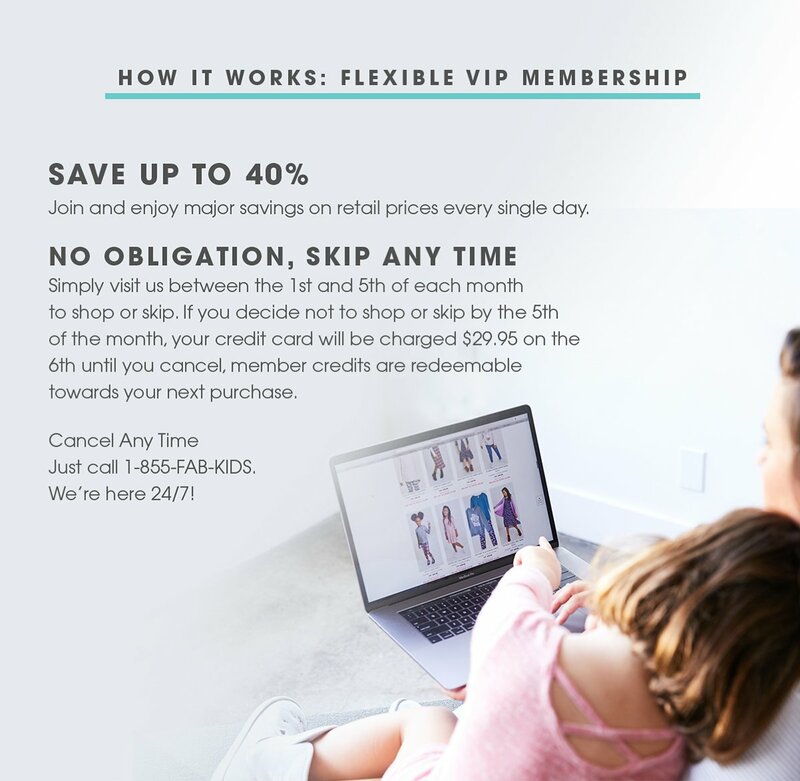 Upon enrollment in the VIP Membership Program, if you do not make a purchase or Skip A Month between the 1st and 5th of the month, your credit card will be charged $29.95 USD for a member credit on the 6th until you cancel. You may cancel any time by calling 1-855-FAB-KIDS. Offer is by invitation only and valid for new FabKids customers only (1 free outfit or shoe per household). This promotion is valid through 11:59pm PST 03/12/2019. 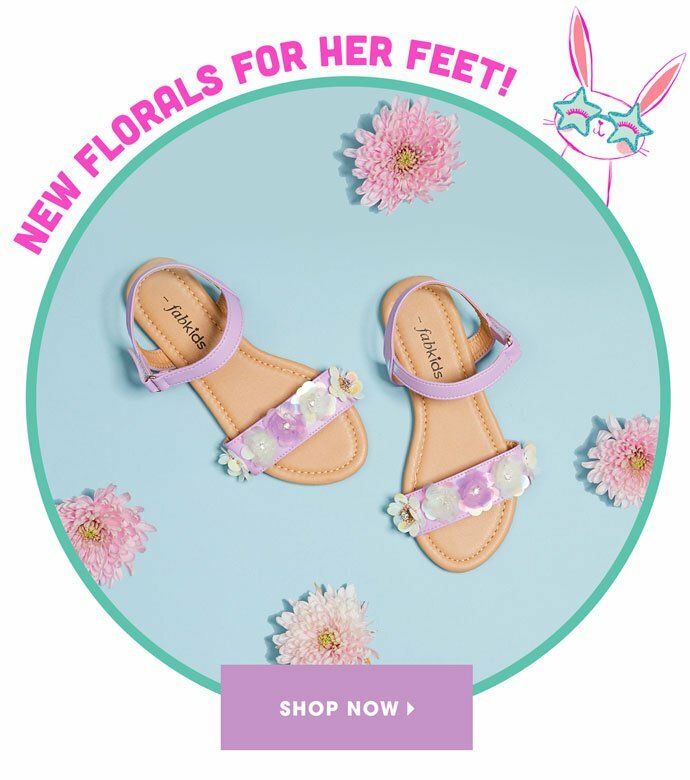 With this free outfit or shoes offer, you are activating your VIP Membership for $29.95 per month - though there is no obligation to buy and you may skip any month. Standard shipping cost is not included in offer. Offer is non-transferable and may be used only once. This offer cannot be applied to previous purchases or combined with any other promotions or discounts. Pre-paid credit cards can not be used to place an order using this offer. 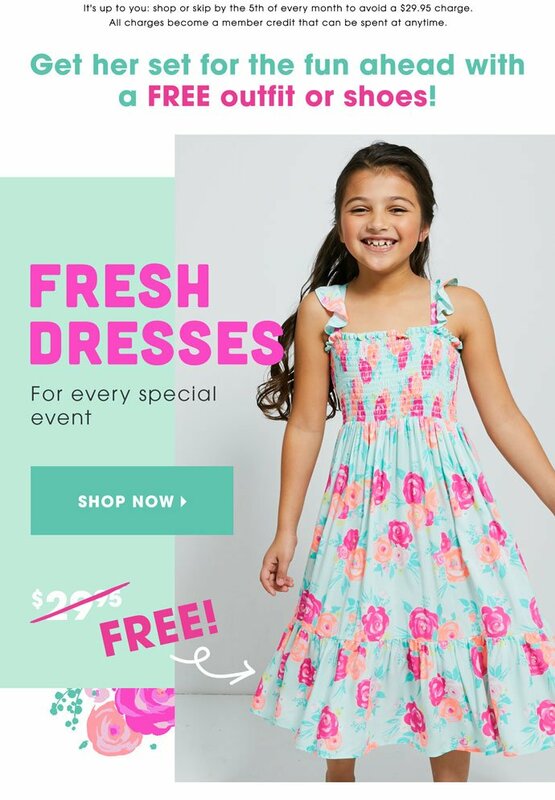 FabKids standard return policy does not apply to this promotion. Items received through this offer are not eligible for returns or exchanges and are not redeemable for any monetary value. Offer subject to availability and may be changed or ended at any time. Orders to Alaska, Hawaii, APO/FPO and U.S. Territory addresses are subject to a $9 shipping charge each way. Orders bound for Canada are subject to a $14.95 shipping charge. FabKids does not offer exchanges to Canada at this time. If you would like to exchange an item, please return the item and place a new order. New orders are subject to our standard shipping rates. Visit our Shipping & Returns page for more information about our shipping and return policies. To ensure that our messages get to you, please add Fabkids to your address book or safe sender list. If you would prefer not to receive emails from Fabkids.com, please unsubscribe or call 1-855-FAB-KIDS. Tomorrow's too late! 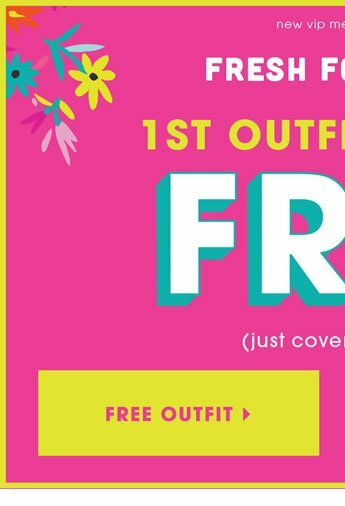 Redeem your FREE style now. 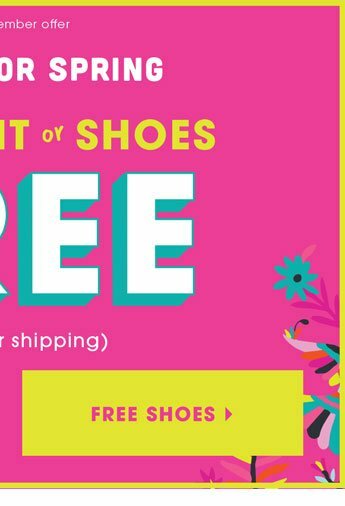 Want a FREE Pair of Shoes? Just open and pick your favorite. Rainbow Swirl Collection Is Here and on SALE!